Faraway places, breath-taking landscape panoramas and spectacular city views are just a few clicks away with Rose Calendars. 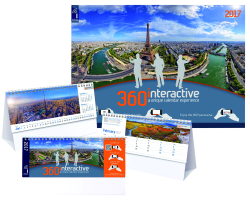 The interactive 360° calendars that picked up a distinction in the category Communicative Products whisk the users off on a thrilling journey – from the flat calendar sheet to a 360° panorama view that can be experienced using a smartphone, tablet or desktop computer. An imprinted QR code takes the users to the interactive view of the photos that are reproduced in ultra-HD quality. The users can control the angle and zoom themselves. As, according to own accounts, the first supplier of this interactive calendar model, Rose Calendars is creating an ideal connection between printed and online contents. The production of the desk and wall calendar made of silk-matt coated paper occurs using green electricity, the rear panel and the delivery box are made out of recycled cardboard. Each page displaying the month can be customised with a logo, advertising message or company details, furthermore on request individually designed sheets can be added. Produced in the appropriate CI-design, companies from the IT and tourism industry, as well as shipping companies, import firms and groups with subsidiaries worldwide advance into becoming interactive travel guides for their respective target groups.